After surviving facing hobgoblins, poisonous lizard fish, a party of murderous adventurers, a dragon, a necromancer and a swarm of evil pixies, Jig Dragonslayer thinks he might finally be safe. Then a group of human warriors invade the mountain looking for the Rod of Creation once again. The next thing he knows Jig and his friends find themselves embroiled in a war involving elves, humans and an army of monsters. This time even Jig's god, Tymalous Shadowstar, may be in danger as another of the forgotten gods appears on the scene once more. The third installment of the series feels less like a parody of the fantasy genre and more of a serious novel. It does still have its funny moments, like the part about Golaka's ogre meat dessert having layers, or the goblins playing the game of Toe Stub, but there are somber moments too. Shadowstar's healing magic has its limits and Jig has to face some tough choices. This book sees the return of characters I had become fond of including Smudge the fire spider, Darnak the dwarf and Relka the goblin, now a devoted worshipper of Shadowstar as well as besotted with Jig. It also introduces Genevieve, last of the siblings in the line of royals who keep trying to take the Rod, and Oakbottom the walking tree who delights in throwing humans around. It was great to see Jig rise to the occasion and actually become a leader to his people, much to his own surprise. And how can you not love the image of the runt riding an angry wolf into battle! 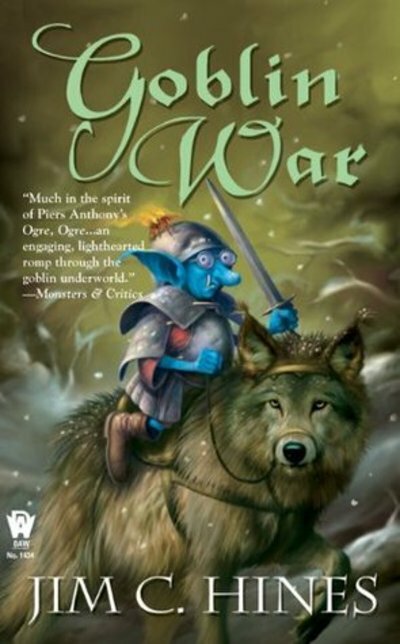 Goblin War is a fitting end to the trilogy which ties up the loose ends nice and neatly. It's a fun read with likeable characters, a believable plot and a satisfying conclusion.